The use of bicycles is included at no additional charge – two bikes per room! Weekday visits: When you stay at the Moffett House Inn early May through mid June you will receive the 3rd night for free. Over the last five years the Moffett House Inn has gone through a complete remodel. The entire inside of the house, including all 10 guests rooms, has been replaced or renewed. We celebrated our grand opening Memorial Day weekend 2004. The use of bicycles is included at no additional charge – two bikes per room – that has over a $40 a day value! We also now have a computer in the lobby with internet access. We are open year round. Come by now and check us out! We are very excited to show you the NEW Moffett House Inn. – Russ. 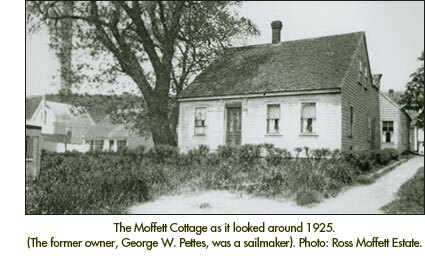 Built in 1860, the Moffett House Inn was formerly the home and studio of Ross Moffett, a well known local artist. The inn has been restored to offer accommodations with all the charm of the old, while providing the comforts of today. Our success is built upon providing a comfortable and homey environment where a friendly and relaxed atmosphere prevails at all times. Guests can meet and enjoy each other's company on one of our patios or in the common room. All 10 rooms have basic cable, 20 inch TV/DVD/CD players mounted on the walls, comfortable beds, and wireless internet. We also have a free DVD library with over 150 movies. All rooms have air conditioning and mini refrigerators. Coffee, orange juice, bagels and/or muffins are served daily in the high season. There is coffee and orange juice daily year-round. The Moffett House Inn's central location is perfect for those coming to Provincetown by ferry, car, or bus. The Moffett House Inn is within walking distance to all of Provincetown's ferrys and piers. Check out our location on the Provincetown map. All rooms now have air conditioning! Rates for Friday & Saturday nights in the summer are an additional $35 or $40 a night more than the listed rates above. The same increase may apply for all days during Memorial Day Weekend, Fourth of July Week, Bear Week, Carnival Week, and Labor Day Weekend. Minimum stays may apply on weekends, holidays, special events and during summer months. Higher rates than what are listed above may apply during peak season and for some special event and holiday weeks. Rates are based on double occupancy  each additional room guest will increase the nightly rate by $35. *See specials and discount section for details.